PropCad includes calculations of the propeller's moment of inertia for use in shafting and vibration calculations. 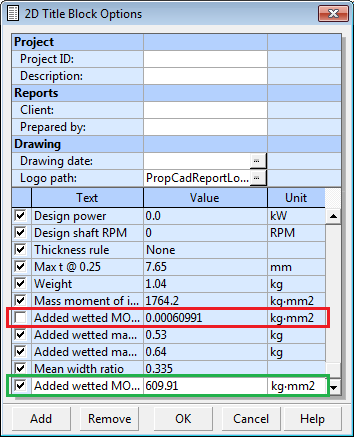 The 2D drawing has a known issue with the units display for Added wetted MOI (SG=1). The issue involves the displayed value on the 2D drawing title block. This value was always reported in kg-m2, but labeled with kg-mm2 when the PropLengthUnits = mm. The value for Added wetted MOI (SG=1) must be corrected from kg-m2 to kg-mm2 by multiplying the calculated value by 10^6 (or 1000000). An example of this error is shown below. 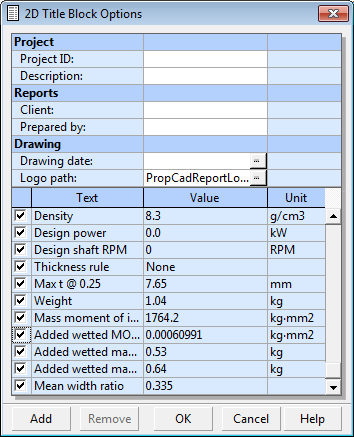 This project is from PropCad 2015.4 with Prop length units = MM. 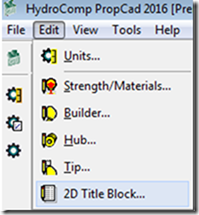 This issue has been corrected in PropCad 2016.1 and newer. Work-around 1) Change Prop Length Units from Millimeters to Meters. This will change the corresponding inertial units label on the drawing to kg-m2, which matches the report values for inertial properties. Step 1) Open the 2D Title Block options (See Figure 1). Step 2) Uncheck the option for the Added wetted MOI (SG=1) from the list, and click “Add” to insert an empty row. Now, populate this row with the correct info for the drawing. First, calculate the proper MOI value by multiplying the existing MOI value by 10^6 (or 1000000). Enter this value into the center cell. Use the correct label of Kg-mm2. Step 2) Regenerate the drawing to see the newly added parameter.